London Transport posters played an indispensable role in the field of graphic design, particularly in the 1920s and 30s. In 1908, Frank Pick assumed responsibility for London Transport’s publicity and commissioned designs from internationally known artists as well as promising newcomers. Among them, a talented American poster artist and graphic designer, Edward McKnight Kauffer (1890-1954), helped shape the aesthetic of London Transport between 1915 and 1939. During that period, Kauffer created 140 posters for London Transport. Born in Montana in 1890, Kauffer became a kind of design factotum, working on everything from scenery painting to sales to advertising for a theatrical troupe in 1907. After working for Paul Elder’s Bookshop and Art Rooms in San Fransico, Kauffer was inspired to pursue his first formal art training at night school at the Mark Hopkins Institute. A regular customer, Professor Joseph McKnight, became his patron and lent him enough money to study at the Art Institute of Chicago, and travel in Paris, Munich, and Venice. At the outbreak of the First World War, Kauffer moved from Paris to London and, with Pick’s commission, produced his first set of posters for London Underground. Kauffer created this poster in 1924 to promote the use of trams after tram lines were extended to Twickenham for the first time in 1902. Kauffer designed four other posters in this series: Near Waltham Cross by Tram, Bushey Park by Tram, Hadley Woods By Tram, and The Colne River at Uxbridge by Tram. Each promotes a different destination accessible by tram. To encourage such travel to Twickenham, Kauffer presents a placid, stylized landscape, with sailboats and a tree-lined shore reflected in the rippling surface of a lake. A house on the far right suggests to prospective commuters “there is your destination.” Beneath this charming scene, umber and olive text harmonizes with the the palette of the landscape. As architectural historian Arian Forty noted, the purpose of [these] posters aimed to encourage people to make journeys on the off-peak services and the outer suburban routes. 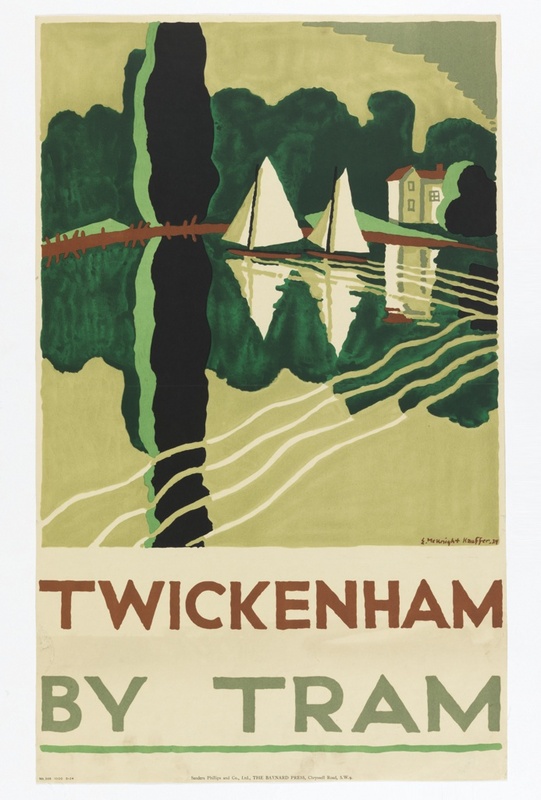 Unlike earlier publicity posters for London trams in the 1910s, including a Twickenham by Tram poster attributed to Charles Sharland and another by Alfred Fontville de Breanski, Kauffer’s design incorporates bright color and abstracted and simplified forms of the trees and sailboats to catch the attention of urban dwellers on the go. As specialist in British art and design of the 20th century Paul Rennie stated, “Kauffer provided a new kind of bridge between the separate worlds of fine art and poster design…Kauffer was able…to develop a visual language that synthesized a number of different visual elements from modern art into poster design.” In other words, he was successful in translating modernist aesthetics for a general public. Weixin Jin is a graduate student in the Design History and Curatorial Studies program at Parsons / Cooper Hewitt and works in the Smithsonian Design Library. Jin is a researcher in the fields of Decorative Design and Museum Studies, and a lead author of Design Museum that was published in 2014. Paul Rennie, Modern British Posters: Art, Design & Communication. (London: Black Dog Publishing, 2010), 76. Stephen Eskilson, Graphic Design: A New History. (New Haven: Yale University Press, 2007), 152. “Road Rail and River,” http://www.twickenham-museum.org.uk/detail.php?aid=426&c id=45&ctid=4. Adrian Forty, Objects of Desire (New York: Pantheon Books, 1986), 237.